I'm pie challenged. But I'm working on it. About a month ago, my mom and I spent an entire morning making pie crusts. Two weeks ago I took a class on pie making. And last week, I became the proud owner of Nancie McDermott's cookbook, Southern Pies, A Gracious Plenty of Pie Recipes, From Lemon Chess to Chocolate Pecan. 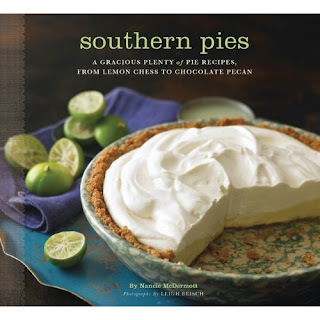 Whether you're pie-challenged like me or love baking pies (apparently there are people for whom the latter is true), you should have a copy of Southern Pies on your bookshelf. Upon my first perusal, I was captivated by Leigh Beisch's stunning photography and the book's clean, simple design. When I began reading the recipe titles, I realized that I had never heard of many of them, despite the fact that I lived in North Carolina (McDermott's home) for nearly seven years. Tell me. Have you ever heard of "Syrup Pie," which McDermott describes as "good and plain and pure, just like the syrup in the pitcher on the kitchen tables in many an old-time Southern home"? How about "Sweet Tea Pie" made with strong brewed tea and lemon juice? Or "Irish Potato Pie" made from mashed white potatoes seasoned with cinnamon and nutmeg? Each of the 60 Southern pie recipes comes with its own story, which is sometimes sweet, sometimes savory, but always delicious. And the recipes are clearly written and easy-to-follow. If you're looking for new-fangled pies, this book is not for you. But if you're looking for a book with classic Southern pie recipes, solid pie making advice and enticing photos, then this is definitely your book. Laced with fragrant cinnamon, allspice, this sweet potato pie smells just like the holidays. And since it's make with sweetened condensed milk, the custard is velvety smooth and dense, just the way I like it. You can eat it plain, but I'd suggest topping it with a dollop of bourbon-infused whipped cream, because in case you didn't know, sweet potatoes and bourbon are great friends. I plan on making several more pies from the book including Blue Grass Cranberry Pie, Butterscotch Pie and Molasses Pie. After which I will no longer be pie-challenged. I hope. 1. Heat the oven to 350 degrees F. Line a 9-inch pie pan with crust and then crimp the edges decoratively. 2. In a small bowl, combine flour cinnamon, allspice, cloves, baking powder, and salt and use a fork to stir them together well. 3. Place the sweet potatoes in a medium bowl and beat them well, using an electric mixer at medium speed or a whisk or big wooden spoon. Add the eggs, one at a time, beating well after each addition. 4. Add the sugar and beat to incorporate it completely into the sweet potato-egg mixture. Add the spice mixture, milk, butter, and extract, and beat at low speed to combine everything evenly and well. 5. Pour the filling into the piecrust and place it on the lowest rack of the oven. Bake until the edges puff up and the center is fairly firm, wiggling only a little when you gently nudge the pan, 40 to 50 minutes. 6. Place the pie on a cooling rack or a folded kitchen towel and let cool to room temperature. NOTE: Since this sweet potato pie calls for 1 crust only, you will have an extra crust that you can refrigerate or freeze for future use. Please see step 4 for instructions. 1. In the work bowl of a food processor fitted with a metal blade, combine the flour and salt. Pulse for 10 seconds. Add the butter cubes and pulse until the mixture resembles coarse sand with some small lumps., 30 to 40 seconds. 2. Add 3 tablespoons of the ice water and the vinegar and pulse 5 to 7 times, until the dough just barely holds together in the work bowl. Add another tablespoon or two of ice water if needed just to bring the ingredients together. Turn it out onto plastic wrap and pat the dough into two separate disks; refrigerate them for at least 1 hour. Set one or two disks out at room temperature for 10 minutes before rolling. 3. Roll out one of the dough disks on a lightly floored surface, to a circle about 1'8inch thick and 10 inches wide. Carefully transfer it into ta 9-inch pie plate. Press the dough gently into the pan and trim away any excess dough, leaving about 1/2-inch beyond the edge of the pan. Fold the edges up and over, and then crimp the edges decoratively. Or presst he back of a fork into the pastry rim, working around the pie to make a flat edge marked with the tines of the fork. If not filling the crust soon, refrigerate it until needed. 4. To make the crust in advance, wrap it well in plastic and refrigerate it up to 3 days, or freeze it for up to 2 months. You can buy Southern Pies, A Gracious Plenty of Pie Recipes, From Lemon Chess to Chocolate Pecan (Chronicle Books, 2010) online at Amazon or wherever books are sold. Special thanks to Nancie McDermott who generously sent me a signed copy of this book ASAP when the one I ordered online didn't show up in time for Thanksgiving. I owe you a lunch at Crook's Corner next time I'm in Chapel Hill, Nancie! I, too, am pie-challenged and really need to take some steps to get over that. Thanks for the review of this book - I am intrigued by the syrup pie. I fall into the category of people who enjoy making pies. I like that you can just toss everything into a crust and pop it in the oven. I haven't made one in a while though, i find them hard to finish since you can't really half a pie recipe. Some of these classic southern pies sound new-fangled to my northern ears! I never realized how much variety there was in this cookbook. Sounds like a good read. I love love love sweet potato pie! Total comfort food. Wow. This looks wonderful. And the other pies you mentioned really pique my curiosity! I might just have to pick up a copy of this cookbook! I used to be pie-challenged, until I found those flexible cutting boards. You can roll out the pie crust, then position it over the pie plate, and gently remove it by bending the board as you go. This avoids using extra flour for rolling, which can make a crust tough. Works great for rolled cookies too. You may need a thin knife to get the dough to dislodge if you rolled too hard, but it still works like a charm. I've probably made hundreds of pies in my life, but never a sweet-potato one. This goes into the recipe bookmarks. Happy to hear Nancie has a new book! I'm sure it will be just as great as her cake cookbook. She sat beside of me at a cooking class in Chapel Hill at A Southern Season last year and it was a pleasure to chat with her. I didn't realize you spent a few years in Chapel Hill--my husband & I are UNC grads & our son is waiting to hear if he will be accepted into next fall's freshman class. Go Heels!! In the epic pie-versus-cake battle, I have always been firmly in the pie camp. Pie is one of my very favorite breakfast foods. I've made lemon chess pie (and it was delicious), but never sweet potato pie. Then again, I'm a northern girl. it sounds like you made an outstanding sweet potato pie! The crust sounds wonderful, I will definitely check out that cookbook! This looks amazing! For the first time this year, I put on the Thanksgiving dinner for my family. It was busy and crazy, but such a blast! 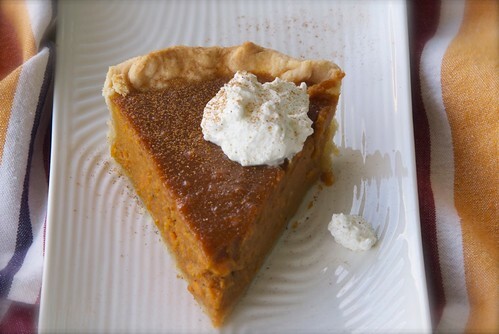 I am deffinately going to try making this sweet potatoe pie!